Home » Sir William Gascoigne, Chief Justice of the Kings Bench. 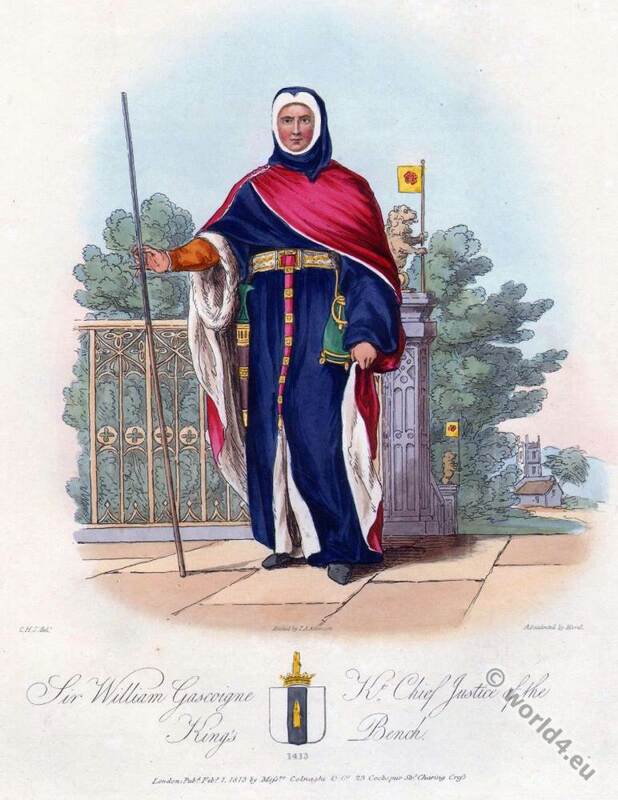 Sir William Gascoigne. K. Chief Justice of the Kings Bench 1413. 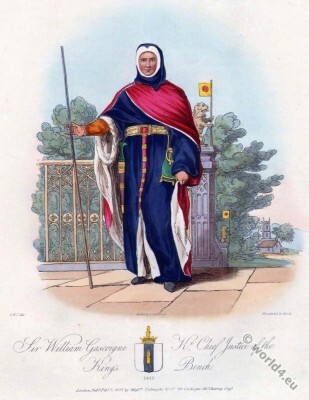 Sir William Gascoigne (c. 1350 – 1419), Knight, Chief Justice of the Kings Bench in 1413. Reign of King Henry IV. Born at Gawthorpe Hall, Harewood, Yorkshire. Son of William Gascoigne IX and Margaret Agnes Franke. Married to Elizabeth Gascoigne; Anne Lynley and Johanna Pickering. Children: Sir William Gascoigne of Gawthorpe, Knight valet of the Crown; Margaret Gascoigne; Agnes Constable; James Gascoigne; Richard Gascoigne; Robert Gascoigne; Elizabeth Redman. Source: Selections Of The Ancient Costume Of Great Britain And Ireland, from the 7th to the 16th Century by Charles Hamilton Smith. London: Printed by William Bulmer and Co. Shakespeare-Press, for Messrs. Colnaghi and Co. Cockspur Street, 1814 Engraver: Atkinson, John Augustus, 1775 c.- 1833, Havell, Robert, d. 1832, Merigot, James. Hill, John, 1770-1850. 15th to 16th century fashion history. This entry was posted in 1413, 15th Century, England, Middle Ages and tagged Costume Of Great Britain And Ireland, Gothic costumes, Medieval costume on 11/30/15 by world4.